When you think of door hangers, you may picture the classic Do Not Disturb sign in your hotel room, but call on your imagination and printed door hangers can be used as a marketing tool in many industries. APFD can Design, Print & Distribute Door Hangers. There are many TV channels, magazines, newspapers, websites but only ONE FRONT DOOR to enter in the house. Our Door hanger distribution Melbourne works and has proved very effective and low cost advertisement. 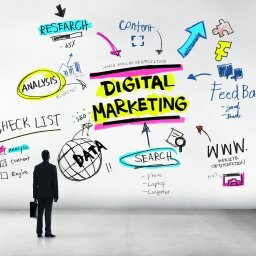 It’s a unique idea to spread out word and your promotional message. Not just on first glance, either. A really powerful design has the potential to be glimpsed and absorbed every single day. So this is a really effective strategy for getting your business, brand, and contact details firmly implanted into the hearts and minds of your future customer base, without them even consciously realising it. Our experienced team of top designers at APFD know all the secrets and tricks to help you develop a top-notch hard-working Door Hanger for your business. One-quarter-A4 stubbie – 148mm high x 105mm wide — these door hangers are the same size an A4 letterhead that has been folded into quarters. Below are images that shows the sizes of the door hangers when compared to a standard A4 business letter. 300gsm Gloss for digitally printed door hangers. 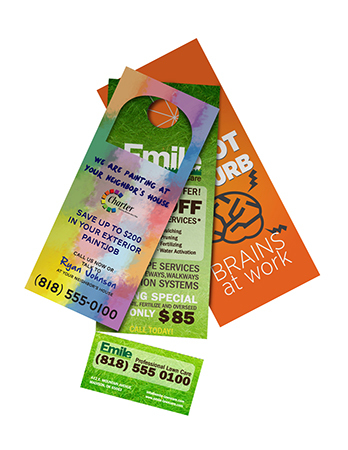 Offset-printed door hangers come in set quantities. These quantities are as small as 500, and as large as 50,000. If you wish to order a larger quantity, then contact us and we will arrange a special quote. Digitally-printed door hangers are available in almost the quantity that you want. So, if you want exactly 55 door hangers, then you can order that exact number. You can submit up to ten different designs with the one order. However, all designs must be ordered in equal numbers. So, you could order 500 of each of four different designs (i.e. : a total order of 2,000 door hangers), but you could not order 500 of one design and 1,000 of a second design.